ATA Fast Fits accreditations are the latest training programmes to be redeveloped by the Institute of the Motor Industry (IMI). 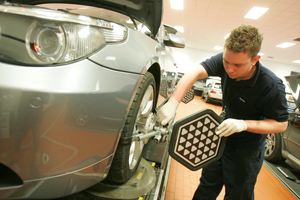 The changes have been made to keep the accreditations in line with advancement in vehicle technology and insist that technicians are required to know how to use diagnostic equipment and carry out four-wheel alignment. Both mobile technicians and those based at workshops are covered in programmes. The accreditations have been partly funded by the UK Commission for Employment and Skills, and piloted by a number of fast fits including Formula One Autocentres, KwikFit and ATS Euro Master. IMI Accreditation Manager Ian Gillgrass, said: “The changes to ATA Fast Fit are illustrative of the challenges facing the whole automotive sector. Put simply, no matter what your level or area of speciality in the workshop, you will find yourself facing a rapid onrush of technological developments in modern vehicles.